Fruits and vegetables are very important to our bodies. They offer us nutritious elements that are crucial towards proper development of our bodies and their antioxidant properties keep us safe from diseases. We, therefore, need to consume fruits and vegetables on a daily basis to be healthy and fit. Health experts recommend five servings or more of fruits and vegetables in a day. Unfortunately, consuming vegetables poses a challenge, as they require some prepping before they can be consumed. This may not be possible if you spend the whole day at work and to be honest, consuming steamed veggies or salads several times a day can be too much even for an ardent vegan. Fruits are easier to work with, as they require washing only. However, you cannot rely on fruits alone; you also need vegetables to have a balanced diet. Therefore, blenders and juicers offer an alternative way of consuming fruits and veggies. They liquefy them into a drink that can be quickly gulped down without much thought. The real question, however, is: how do you prefer taking your fruits and vegetables, like juices or smoothies? This will enable you to decide which device is right for you. Juicers make juices, while blenders make smoothies. Many people cannot tell the difference between a blender and a juicer, and as a result, they cannot decide which device is right for them. A blender and a juicer are two totally different devices. A juicer extracts the liquid part of fruits and vegetables and discards the rest as waste. Some people, however, use the rich-in-fiber pulp waste in soups and stews to thicken them. The thin liquid output is rich in nutrients, such as vitamins, minerals, and phytonutrients and is referred to as juice. A blender, on the other hand, mashes everything that is fed into it and liquefies them into a thick consistent liquid referred to as a smoothie. Smoothies contain all parts of fruits and vegetables, including skins and fibers. As a result, blending has a higher output compared to juicing, because a blender basically retains all parts of fruits and vegetables, while a juicer discards some parts. A juicer uses more fruits and vegetables to get the same output as a blender. Furthermore, dry seeds and nuts can also be used on blenders, which makes them more versatile than juicers. 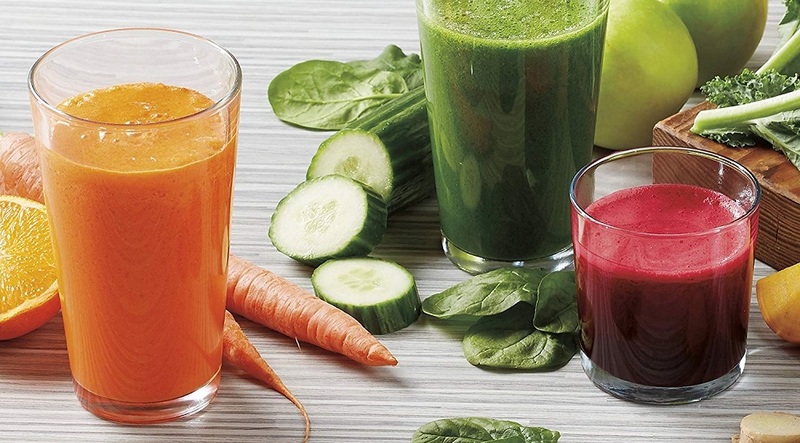 There is a misconstrued notion that blending is healthier than juicing. However, this is not true as output from both devices contains the required nutrients for our bodies. The only difference is that smoothies have fiber, while juices do not. It should also be noted that fiber is indigestible in our bodies and is only used to facilitate proper bowel function. However, our bodies can still function well with low fiber intake. On the flipside, the fiber present in smoothies slows down the metabolic process. This allows for a controlled absorption process of the nutrients into the bloodstream. Juices lack fiber, and as a result, absorption of nutrients can be very rapid leading to a spike in blood sugar level. Since fiber adds bulk to the smoothies, they are more filling and may keep you satisfied for a longer time. Juices have a faster rate of metabolism, and you are more likely to feel hungry after a short period of time. Blending is also quicker than juicing, which is very convenient during those busy mornings. Your decision to choose between a juicer and a blender should be centered on your body’s reaction to fiber. If your body functions well with a low fiber intake, then a juicer is the right device for you. However, if you have intestinal problems, then you will need all the necessary roughages for proper bowel function. In this case, a blender is the right choice for you. We recommend owning both devices to enjoy the benefits of both worlds. If your budget does not allow you to own both of them, then we recommend a Vitamix blender. It is without a doubt one of the best blenders in the market and produces some of the best smoothies. Aside from being a blender, the Vitamix can also be used to make juices, albeit in an unorthodox way. This blender does not extract juice from fruits and vegetables. Instead, it produces whole food juices by pulverizing fruits and vegetables. The juicing process is similar to blending, which basically involves adding all fruits and vegetables into the Vitamix and blending them. To get the right texture and consistency, you may add more fruit to make the smoothie thicker or more water to make it thinner. Once you get the right consistency, you need to pass the smoothie through a mesh strainer or a filtration bag to sieve away the fiber pulp and retain the juicy part. We understand that the process is a bit labor intensive, but it still gets the job done. With the Vitamix blender, you will definitely be killing two birds with one stone. In a nutshell, both blenders and juicers are very effective in delivering the right nutrients to our bodies. Juicers produce a highly nutritious liquid that is easily absorbed by the body. As a result, they are highly recommended by doctors for patients who are in need of quick nutrients and energy. On the other hand, blenders retain fibers in addition to the various nutrients that are already available in smoothies. Despite being indigestible, fiber helps in the absorption and expulsion of cholesterol from the body. It also prevents constipation by facilitating proper bowel movements. If you are not able to own both devices, then invest in a Vitamix blender. This device is the answer to your dilemma.